Hurry up, today is the last day when you can take an advantage of shopping with extra discount at U.S. Zales Outlets and online. 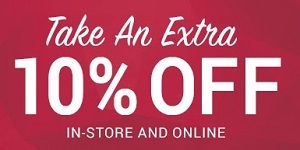 Receive an extra 10% discount on your purchase. Discount applied in cart or at checkout. For more details visit any U.S. Zales Outlet or Zales official website.